Junaid this is for you. Junaid this is to assure you that your death will not go in vain. You are a martyr for the idea of India. You are not a martyr in the conventional sense, that you laid down your life with full consciousness of what you are doing. But your life was snatched away from you in the flower of your youth. But we, who are alive know that you are a martyr for India, the idea of India we all stand for. Junaid (16) was returning from Delhi to his village in Kandhawal in Haryana after Eid shopping along with his brothers Hashim, Mausim. and and Sakir in the crowded Delhi-Mathura passenger. As the train reached Ballabgarh station on Thursday, June 22 some passengers called them “beef-eaters” and “anti-nationals”. According to news reports the men, man handled the brothers and some of them stabbed them. Junaid succumbed to his injuries. 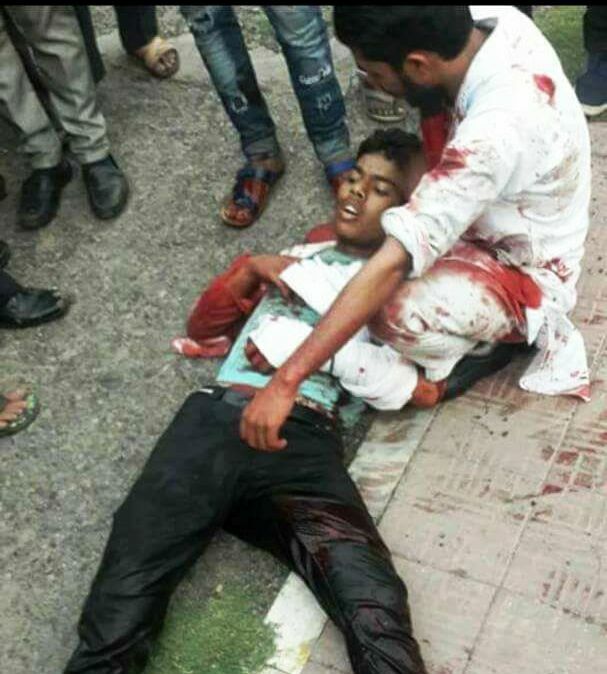 After two hours of violence on the train, Hashim was allowed to get off at Asota with Junaid’s dead body and his two brothers, who too were badly injured. When Narendra Modi government put restrictions on the sale of cattle for slaughter on the third anniversary of his government, this was my worst nightmare. This is what the beef ban has done to India. It has given the Sangh Parivar elements to lynch innocent people for their beliefs, identity and food habits. The lynching of Muslims by branding them as beef eaters started with the lynching of Mohammad Akhlakh in Dadri, Uttar Pradesh, a stone’s throw away from the national capital New Delhi in 2015, a few months after Narendra Modi assumed charge as Prime Minister of India. Since then dozens of Muslim and Dalit men have been lynched allegedly for eating or transporting beef. I don’t generally celebrate religious festivals. But this Eid I went out with my son to have an Eid lunch. In the hotel menu, beef steak was mentioned. I ordered it. The boy was puzzled. Soon the manager came out with an anxious look and explained that they don’t serve beef and also that they never served beef in the hotel. It was a Momos shop and the guys were from Darjeeling, West Bengal. I told them beef is not banned in Kerala and there is nothing wrong with serving beef here. An untold fear is gripping the country from Kashmir to Kanyakumari. Some say it is an undeclared emergency, recalling the 1975 Emergency declared by Indira Gandhi. I think it is worse than that. Then we knew who the enemy was. Now, nobody knows who is your enemy. As it happened with Junaid the man sitting next to you could stab you to death. This is the slow emergence of fascism. India is diving headlong into a deep fascist state. Unless the conscious people of the country rise up, India as we know it will be gone. The blood soaked picture of Junaid lying on the lap of Hashim reminded me of Michelangelo’s ‘Pieta’ in which body of Jesus is lying on the lap of his mother Mary after the Crucifixion. This picture must torment every heart of India. The blood that Junaid shed should not go in vain. It is our duty to make sure that from each drop of blood that Junaid shed, a thousand flowers of resistance shall bloom. In the resurrection of Junaid we will see the resurrection of India. It’s so hard to believe that not a single person stood up to shield these young brothers on the train. … My USA friend, who did it against Serbs holding machine guns pointed at him, didn’t even know the people behind himself, who he protected from being murdered. … If enough people in unison undertake this sort of protective action, then the butchers and slayers can’t harm others. … Which is more important — the life of a human child or a cow? What, in the name of all that’s good, is happening to India! Don’t let the extremists transform India in their own image. The spirit, the aspirations and the hopes of Junaid and many like him will live on ….the blood spilled will not go waste ! Mercyless beast of Hindu’s cow protection groups and anti Muslim people don’t beat/ lynch the innocent people over the matter of cow’s slaughter/ transporting . Since from the Adam and Eve period, Muslim eats beef being of halal meat . Govt tolerates on this matter because of max.hindu govt representatives hurt the sentiments when slaughter .Life is precious from animal . Never say by our religion, kill the person who slaughter cows. It is the act of inhuman nature , uncivilised , and the activities done by this group is wild animals behaviour.We strongly condemn it. Inspite of this think about the development of economy and growth of the nation .